Glaser Wheel Hoe is made overseas and has costly parts not included. Glaser has rubber tire that will dry rot and go flat. Replacement tube for tire sells for $12.95. Glaser requires an oscillating hoe mounting block for $38.00. Glaser 8″ Oscillating Hoe sells for $81.00. Glaser Wheel Hoe retails for $349.00. Hoss Wheel Hoe is MADE IN THE USA. Hoss has a 15″ steel wheel that will last a lifetime. Hoss has more attachments for the wheel hoe. Hoss 8″ Oscillating Hoe sells for $26.99. Hoss Wheel Hoe retails for $169.00. 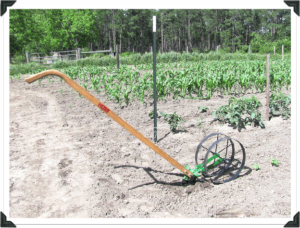 Hoss has a Double Wheel Hoe option that provides added stability and allows for the opportunity to straddle the row when plants are small. 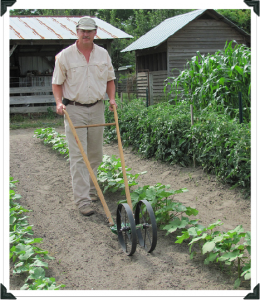 Hoss Wheel Hoe has oil impregnated bronze bushings in wheel that make it easier to push. Tool bar is 1/4″ steel and slotted on back for more implement versatility.